The author is a forage extension specialist with the University of Arkansas in Little Rock. The mere mention of crabgrass evokes responses ranging from clenched teeth and muttered oaths to smiles and nods of approval. Crabgrass has a much maligned history but has gained favor as a high-quality forage over the past couple decades. For years, producers noticed that livestock readily grazed this “weedy grass,” but work from the Noble Research Institute brought it to the forefront as a valued forage when the variety “Red River” was released. This was the first named variety and was the forerunner of others since (for example, Quick-N-Big). I remember a conversation with R.L. Dalrymple, a forage agronomist now retired from the Noble Research Institute. When he told of the many selections of crabgrass they tested ranging from very high yielding to some short, dense types that would be well suited for turfgrass. He knew the latter was a nonstarter, although when my daughter was young, she used to encourage me to plant more of that “soft grass” in our yard because it was not as “stickery” to her bare feet as the bermudagrass I tried so hard to grow. So, where did this grass come from and where does it fit for livestock operations? Crabgrass is thought to have originated in Africa. It was probably first brought to the U.S. as a contaminant in other seed but was also imported as a forage for draft animals. Crabgrass is a warm-season annual grass, meaning it germinates in spring, grows through summer, and dies at fall frost. It is also adapted to more Northern latitudes than bermudagrass, thus providing a summer forage option for a wide geographical area. Several species of crabgrass exist, but the most common one grown for forage is large or hairy crabgrass (Digitaria sanguinalis). Crabgrass has a clump-type growth habit and spreads by long stolons or runners that root down at the nodes. It can grow to over 2-feet tall, is adapted to a wide range of environments, and grows best on well-drained soils. Though crabgrass tolerates drought, planting on sites that are not excessively drought-susceptible during summer will result in the greatest forage production. It is a prolific reseeder, and being an annual species, it quickly colonizes disturbed soil. These characteristics made it a hated weed in cotton and crop fields before the advent of selective herbicides but are advantageous for pastures. Optimum soil pH for crabgrass is quite wide, ranging from 5.5 to 7.5. It is normally planted in mid- to late-spring in Southern areas. Planting after midsummer is risky due to the undependability of late-summer rainfall. Seed a minimum of 2 pounds of pure live seed (PLS) per acre, but planting 3 to 5 pounds of PLS per acre helps ensure better stands. Two-year-old seed has been noted to have a higher establishment rate than 1-year-old seed. Crabgrass seed is hairy and does not flow well through drill seeders. It is often mixed with a carrier such as fertilizer, dry sand, or pelletized lime to improve spreadability. When broadcast planting, the spreader should be driven almost track-to-track since the crabgrass seed will not spread as far as the fertilizer or pellet lime. Plant crabgrass into a tilled, well-firmed seedbed. Seed can be broadcast and then covered by a second pass with a roller or it can be planted with a drill about 1/4-inch deep. Planting too deep is a bigger concern than planting too shallow. Research shows that light stimulates germination and most seedlings emerge from within the top 1/2-inch of soil; very few emerge from more than 3/4-inch deep. 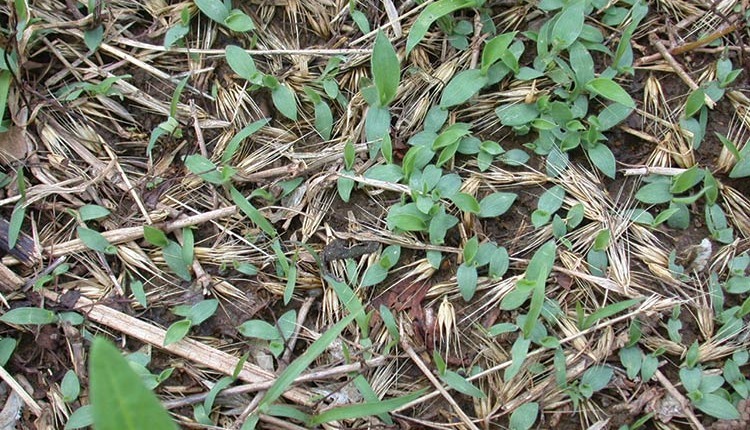 With adequate moisture and temperature, some crabgrass seed will germinate within a few days, though the new stand may continue to thicken over a period of two months. The typical period from seedling emergence to “first grazing” is normally 40 days under good conditions. Once established, crabgrass can be managed for reseeding to produce volunteer stands indefinitely. It is very compatible when grown with small grains such as wheat or cereal rye. The small grain provides forage from late fall into spring, and the volunteer crabgrass fills in to provide forage from summer to early fall. For this system, seed can be overseeded with fertilizer during winter into the fall-planted small grain pasture. Cattle grazing the wheat helps tread the seed into the soil. In subsequent years, the wheat can be no-tilled into the short crabgrass stubble in fall, and harrowing or light tillage around the time of spring “graze-out” of the wheat pasture improves crabgrass seed germination and promotes better volunteer stands. 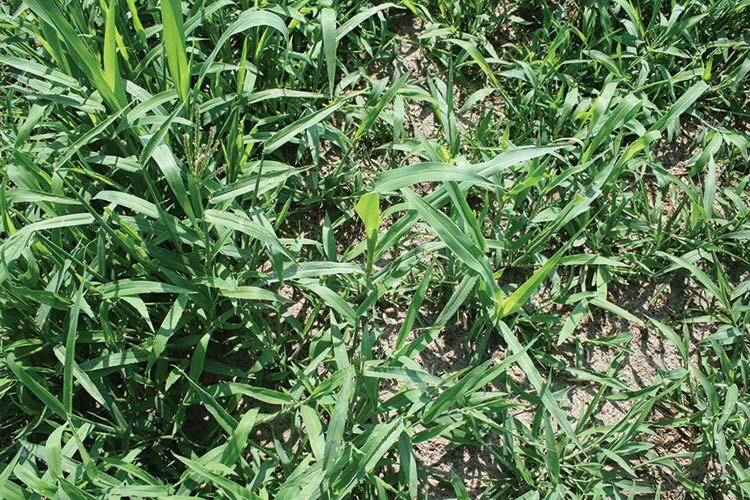 Some Arkansas producers have had excellent success growing a wheat-crabgrass combination for stocker cattle, reporting gains of over 2 pounds per head per day. Crabgrass responds well to rotational grazing. Grazing can begin when it reaches 4 to 6 inches tall. During the growing season, crabgrass is very palatable and is often grazed first by animals turned into a new pasture; however, crabgrass becomes very unpalatable after a killing frost and is usually avoided by grazing animals. Plan to use grazeable forage before frost occurs. This management approach allows other pastures such as stockpiled bermudagrass or fescue to accumulate growth, which can be grazed later in fall to reduce hay feeding. Crabgrass responds well to nitrogen (N) fertilizer, but it can accumulate high nitrate levels under high N fertilizer or manure applications. Apply fertilizer N in split applications of 50 to 60 pounds per acre for each grazing or hay harvest as needed. Do not apply nitrogen after mid-August, since little growth response would be expected. Cut crabgrass for hay in the boot to heading stage (normally 18 to 24 inches high), which should allow at least two harvests per year. To favor quick regrowth, cut or graze above a 3-inch height to leave some green leaf tissue. Regrowth is supported by remaining leaves and not by stored root and crown reserves. Grazing or mowing the sward too short removes the leaf area and greatly slows regrowth. If crabgrass hay is cut before it makes mature seed, leave 6-inch-wide uncut strips between mower swaths to produce enough seed for reseeding. Due to the hairy stems and leaves, crabgrass hay normally dries more slowly than bermudagrass. Crabgrass contamination of bermudagrass hayfields intended for horse hay is a concern because the slower-drying crabgrass can create “green spots” in baled hay, raising the chance for mold or spontaneous heating. The darker color of crabgrass hay also has less eye appeal than the green color of well-cured bermudagrass hay. Once established, crabgrass can quickly cover bare soil. Be cautious of seeding too deep. Cattle can be grazing crabgrass about 40 days after seedling emergence. Dry matter yield of Red River crabgrass in a five-year Arkansas forage trial averaged 4.4 tons per acre. Yield can be erratic, depending on summer rainfall and can range from 1 to 2 tons per acre to over 5 tons per acre. Research at the University of Arkansas Southwest Research and Extension Center near Hope showed a boost in dry matter from 2,527 pounds per acre to 6,454 pounds per acre when cutting interval was extended from 21 days (stem elongation) to 35 days (early heading). Even with its unfounded reputation as a weed, the forage quality of crabgrass is typically better than that of most other summer grasses like bermudagrass, bahiagrass, pearl millet, or sorghum-sudangrass hybrids. Arkansas studies showed that common crabgrass quality remained high even as plants reached maturity. The crude protein (CP) concentration of crabgrass declined in a narrow range from 21 percent in the vegetative stage in July to 15.9 percent at the milk stage in late August. Neutral detergent fiber (NDF) and acid detergent fiber (ADF) content showed relatively little change over the same time span. Due to the lower fiber content, crabgrass forage was digested 44 percent faster in the rumen than high-quality bermudagrass hay. Crabgrass is gaining the reputation as high-quality forage instead of as a weed. Palatability and forage quality are excellent. It is useful for providing high-quality summer pasture or hay to support good animal performance for stocker calves, dairy cattle, small ruminants, and horses. It works well in mixtures with small grains and some perennial cool-season grasses. The author wishes to acknowledge his University of Arkansas colleagues, Paul Beck, Dirk Philipp, and Kenny Simon, for their contributions to this article. This article appeared in the February 2018 issue of Hay & Forage Grower on pages 6 and 7.